As you might guess, the unfortunate news about the Netrunner license hit the card game team pretty hard. Android: Netrunner was one of our top games for many years and was extremely popular around the office. It’s a game that will be sorely missed. 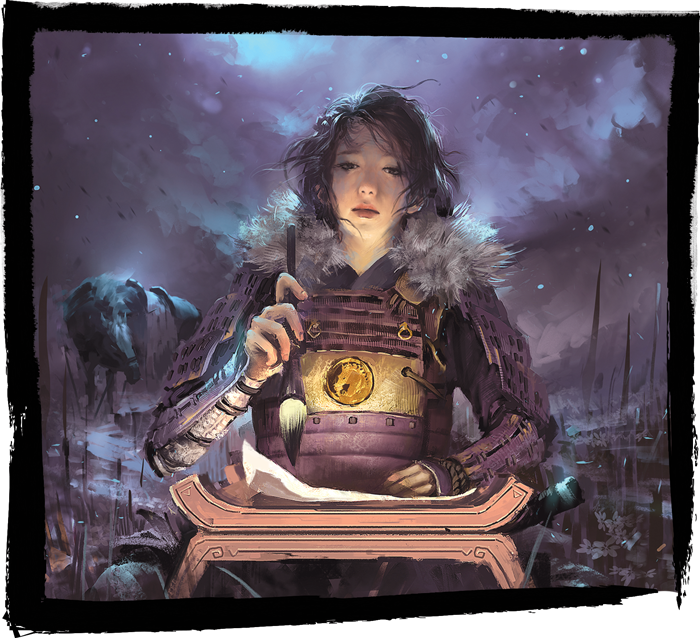 At the same time, we’re very aware that this kind of announcement sends ripples throughout all of our LCG communities, and that members of those communities might have questions or anxieties about what might be in the future for those games. 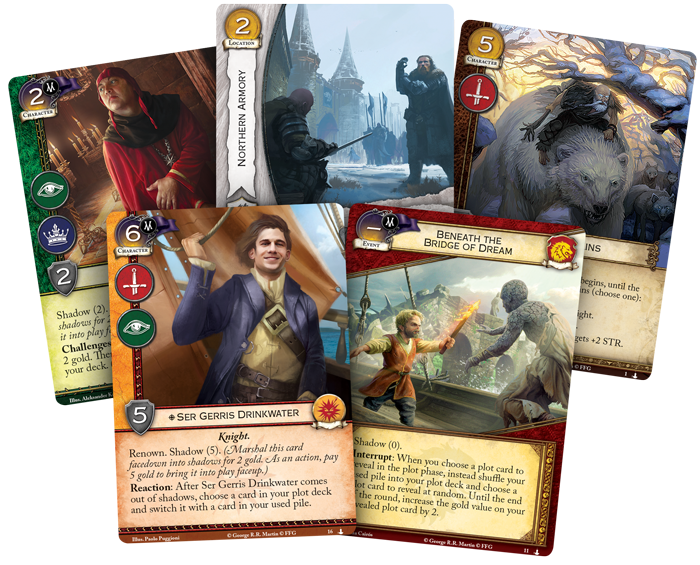 Because information and perspective is almost always healthier than rampant speculation, I spoke with FFG Head of Studio Andrew Navaro and Card Game Manager Mercedes Opheim, as well as the various developers of our LCGs, and put together the following report on the state of the LCG. I’ll start with some big picture perspective from Andrew and Mercedes and follow by focusing on each of our LCGs in a talk with its developer(s)! Q: What do you like best about LCGs? Or, put another way, what does the LCG model mean to you? Andrew: The obvious answer is that there’s no “chase” in an LCG. People can find the cards they need for their collection, at any time. The less obvious answer is our LCG communities. They’re friendly, welcoming, and really stand out in the gaming world. Mercedes: I love the idea of a game that grows and evolves on a regular basis. People know exactly what they’re purchasing with each new product, and they have choice about whether or not they want to pick up those cards. I’m also a fan of how every game brings something different to the table. Each one holds its own unique place in our catalog. 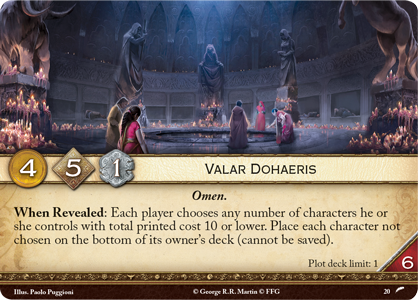 Q: Recently, there have been a number of new LCG initiatives—things like the A Game of Thrones: The Card Game intro decks, new product types for Arkham Horror: The Card Game and Legend of the Five Rings: The Card Game, a new release strategy for Legend of the Five Rings, and new rulebooks for The Lord of the Rings: The Card Game. Is there an overarching goal or strategy behind these changes? 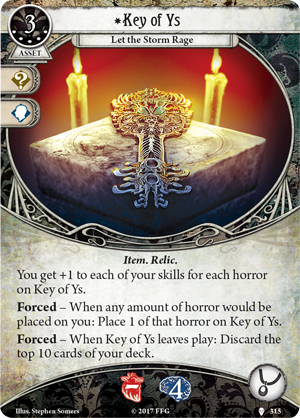 Mercedes: I think we’re moving away from a cookie-cutter structure and trying to find ways for each game to develop and be treated as its own entity, rather than in the “standard” way for the LCG format. Andrew: Yes, exactly. We’re experimenting with some different approaches and embracing the idea that we treat each game as a unique experience, rather than taking a one-size-fits-all approach with product types, release schedule, and presentation, as we might have done in the past. This isn’t to say that if something works well for one game, and seems to be a natural fit for another, that we wouldn't see that kind of cross-over. It just means that there are more options on the table for each game, and we’re not going to limit those possibilities. 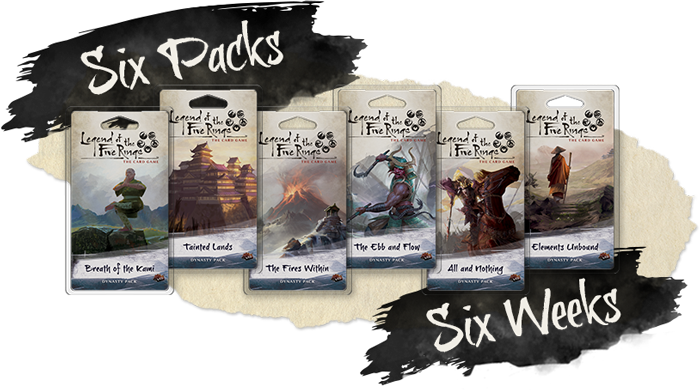 Q: Why did you choose to use the “six packs, six weeks” format for Legend of the Five Rings: The Card Game and what are the benefits of this format? Andrew: The six packs, six weeks idea was about turning the release of a new LCG cycle into an event. It’s exciting when a new cycle is announced, but it’s challenging, in the case of our competitive LCGs, to maintain that excitement eight or nine months down the road when you’re waiting for that sixth pack to be released. Changing the release of a cycle from a slow burn to a six-week extravaganza of unbridled enthusiasm seemed like something worth trying out. 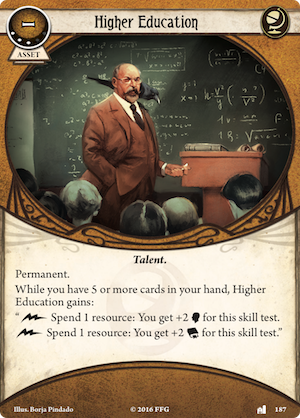 As for the benefits of the pattern, one of the criticisms I’ve heard levied against monthly LCG packs for our competitive LCGs is that if you’re a player devoted to a single faction, there’s not a ton of content for you in a single LCG pack. 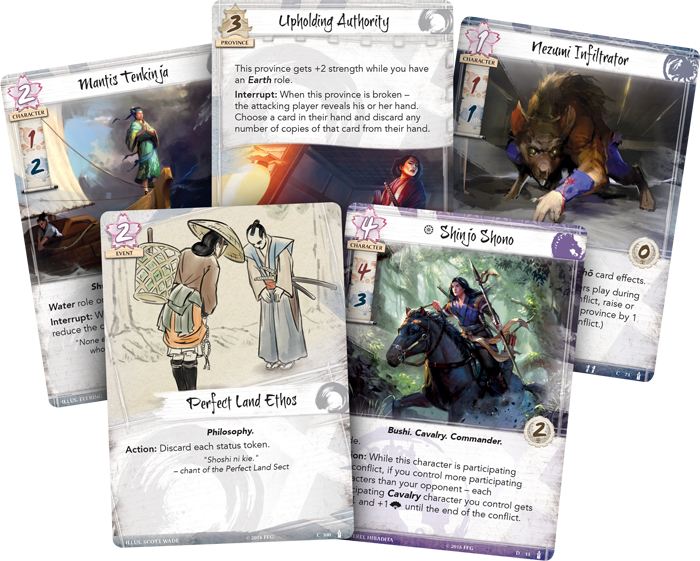 We saw the potential for this to be exacerbated in Legend of the Five Rings: The Card Game, given how strongly players identify with their favorite clan. Now, at the end of six weeks, you have an entire cycle of content to play with, as opposed to having to wait six months to build that deck you’ve been dreaming about. Lastly, having the packs release closer together allows the themes of the cycle to flourish in the metagame right away. The developers do a great job of creating cohesive cycles that feel great thematically and mechanically, but with the six-month release model, it can feel like it takes too long for those themes and mechanics to really sing. Getting the cards into players’ hands quickly gives them more time to experiment with everything the cycle has to offer before the next cycle drops. Q: What are you most excited about for LCGs in the upcoming year? Andrew: Seeing the impact of some of the changes discussed earlier and continuing to experiment with new product types and initiatives. There are a few other items in the pipeline that haven’t been announced yet that are going to make a pretty big splash. Q: What are the biggest challenges facing LCGs? 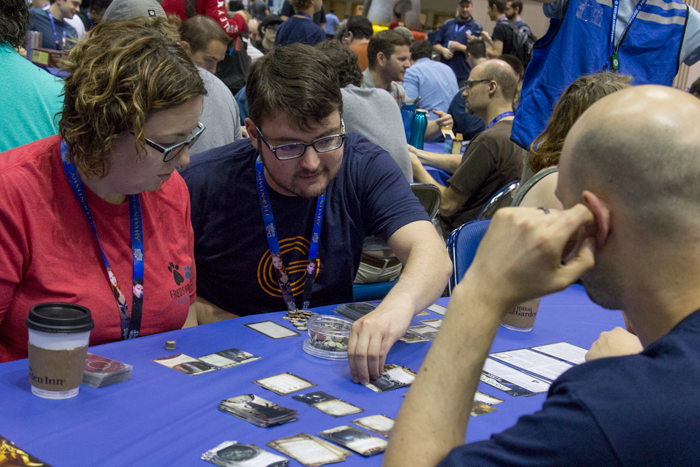 Andrew: I think this applies more to our competitive LCGs than our cooperative ones, but simply getting enough cards out at the right frequency to keep the meta evolving and healthy and engaging, and keeping people connected, is vital. Mercedes: Building and maintaining trust. This manifests in a variety of ways, such as: establishing strong lines of communication, proactively managing our metagames and striving to keep them fresh, and doing all that we can to manage release gaps that occur when we face obstacles outside of our control. It is always our mission to grow and improve, because our players are the reason we're here. Q: How do you see LCGs evolving in the future? Mercedes: We might already be seeing a glimpse of an evolution with the digital version of The Lord of the Rings: The Card Game already in development and moving toward early access. This opens up a vast new frontier for one of these games, and it’s been exciting to watch. 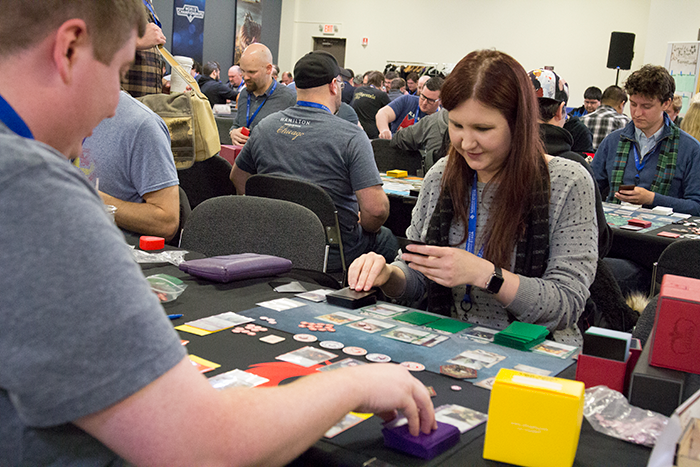 Q: Pie in the sky, unlimited resources: if you could do one thing to make the LCG experience better for our fans, what would it be? Andrew: Infinite resources?! There’d be a never-ending pipeline of new content, a constantly evolving and engaging metagame, and huge teams of developers finetuning the experience to make sure it’s perfect. In the real world, we work with what we have to get as close to that ideal as possible. Mercedes: In the predominantly male LCG environment, sometimes being one of the only females can make you feel awkward or even intimidated (especially in competitive games). I know from personal experience that there’s so much our LCGs have to offer everyone, and I’d personally like to find a way to make them more accessible and to foster a welcoming environment for female players. Q: What have been some of the most successful and exciting parts of the game in the past year? Brad: The launch was awesome. We had great turnout at Gen Con and a very warm reception, and the Kotei events around the world have been very exciting. I’m also happy with how the story is even now being impacted by player participation—you all have made some big decisions that have already had major impact behind the scenes, and I’m looking forward to some of those implications making themselves known. Tyler: As Brad mentioned, it was a very successful launch, setting the stage for all that is to come. I also think that the way the role card choices played out at Worlds provided a strong showcase for the possibilities inherent in that system. We had players planning, negotiating, and strategizing what they wanted to do. There was a game being played around the game, and it really evoked the Rokugan setting in a unique way. Q: What are you most excited about for in the year ahead? Brad: I’m psyched for the release of the Elemental Cycle. This cycle was in development right around the time of the game’s launch, so it was the first time we were able to incorporate the reception of the entire player base into our design—which is huge. And yes, there is a nice boost for the Unicorn clan in this cycle. I’m also excited about the multiplayer format and overseeing its transition from the beta version to a fully realized form. Tyler: In broad terms, as I can’t yet go into too much detail about these items: the story is going to evolve in a very significant manner next year, and we’re going to see something that makes honor and dishonor matter far, far more while playing the game. Q: What are the biggest challenges the game is currently facing? Tyler: For me, it has to be the way that Unicorn is struggling at the tournament level. Fortunately, we’ve been taking steps to address this in development, and I foresee an exciting ascent for this clan—sooner rather than later. Mitigating the release gaps and finding ways to keep people engaged until the next new product is also a high priority. Brad: I agree with Tyler—because of the importance of clan loyalty in this setting, it’s vital that we do whatever we can to ensure that every clan has a fun, thematic, and viable tournament build. We’ve been working to help Unicorn along, and the game will be much better for it. Q: If you could do one thing to improve the game experience, what would it be? Brad: I’d like to streamline the rules just a little bit. There are a few things that don’t seem completely necessary to me, that could probably be simplified. The templating on duels seems a little long as well, and that could probably be made more user-friendly. Tyler: I think the role mechanic is an incredibly innovative experiment for a meta-driven game, and it works well within the theme that the LCG aims to explore. There were some other things about the roles that worked well, and some things that still need to be refined. I’d like to revisit a few things about this mechanic with Nate and Brad to make this feature even better. Q: What has been most successful for the game in the past year? Matthew: For me, it’s simply the way people are consuming and discussing the game, particularly regarding the monthly story packs. As these packs are released, I’ve noticed that people aren’t just discussing the cards and the mechanics, but the story itself: analyzing the most recent episode, speculating where it might go next, consuming it in a way that’s similar to how a TV or book series might be consumed. Q: What are you most excited about for the year ahead? 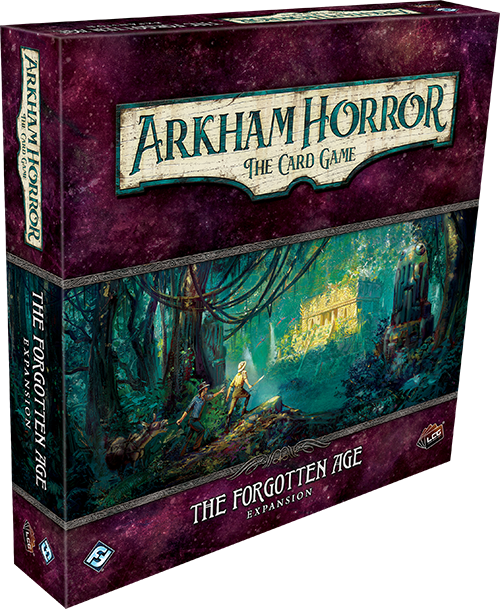 Matthew: Well, the most obvious answer is the continuation of The Forgotten Age campaign—an all-new story about an expedition into wondrous new locations, featuring a string of lethal enemies and five new investigators. And people are ready for it! Then there’s Return to the Night of the Zealot. As an upgrade expansion, this is a new product type, and it adds a lot of replay value to the Core Set. Finally, our Gen Con and Arkham Nights scenarios offer an opportunity for the community to actively participate in the game’s future development. This is a big step for this type of process in this game, and if it goes well I’m hoping to do more in this vein in the future! 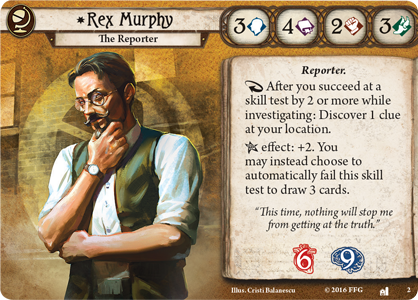 Matthew: There are currently a few cards that are dominating on the player side, things like Higher Education (Blood on the Altar, 187), Rex Murphy (The Dunwich Legacy, 2), and Key of Ys (Dim Carcosa, 315). Figuring out a means to manage the metagame is high on my list of priorities. Matthew: I’d just like to get more content out, and faster! Daniel: I think the Flight of Crows cycle of Chapter Packs has been the highlight of the past year. This set was well-received and really shook up the meta. 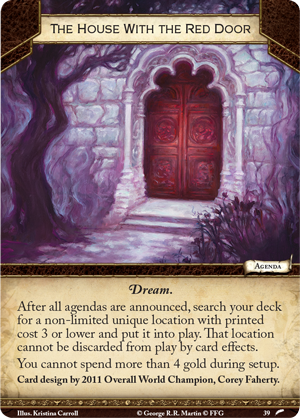 The House with the Red Door (Journey to Oldtown, 39) agenda introduced some new types of decks to the meta, and Valar Dohaeris (The Archmaester’s Key, 20) provided a new reset plot that dramatically changed the way people evaluate a board state. The first is the intro decks. With one for each faction, these will be a great way for new players to get started, or for casual players to get a little more involved with the game. They should also be a powerful tool for more experienced players to use while introducing the game to their friends. Second, we have the return of shadows. This is the biggest and most impactful new mechanic we have added to second edition, and it adds a rich new dimension to the game, both thematically and mechanically. Shadows is often-cited as a fan-favorite mechanic of first edition players, and its introduction offers up some strong nostalgia for those players, while also providing a new set of experiences for players who only know the game’s second edition. Daniel: Right now, I think it’s finding the best way to use the tools we have to balance the meta and keep the environment healthy. We’re working our way through this challenge with the restricted list, and other initiatives—like the rookery—could be helpful as well. Daniel: I feel that the game’s rotation policy was established during the first edition days and was kind of grandfathered in for second edition. I’d like to re-evaluate these policies, and make sure we have a plan in place that will do the most to keep the second edition metagame alive and engaging. Caleb: Completing the saga expansion series with The Mountain of Fire was a major accomplishment. Players can now play through the entire story from start to finish. It’s been particularly rewarding seeing how people deal with The One Ring at the end, as we’ve been building up to this epic moment for years! Caleb: There’s quite a bit to look forward to in this next year. First, we have the Gen Con and Fellowship event scenarios, which introduce a completely new format for playing the game. I had a blast working on these products and the playtesters loved it, so we can’t wait until it’s out and available for everyone to try. Second, the progress that’s being made with the digital version of the game. Seeing the game we know so well evolving into something new is fascinating, and I’m glad to have been a part of that process. 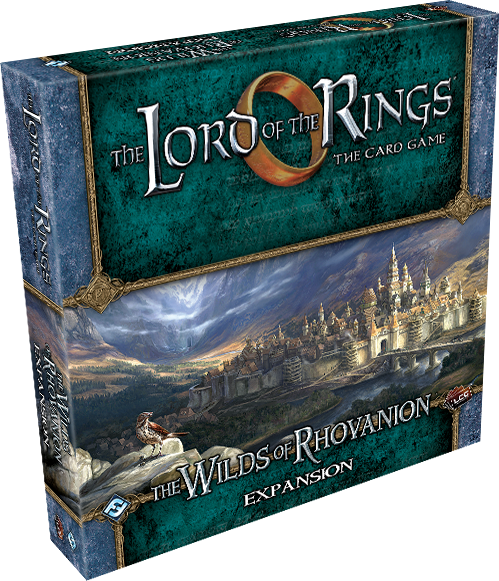 Finally, the next deluxe expansion, The Wilds of Rhovanion, is nearly here! With this and the following cycle, there are a few things that fans have been clamoring to see for a while that we’ve been holding back on, and there’s a good chance you might see some of those things here! Caleb: Bandwidth is certainly challenging—trying to keep up with the demand for new content and experiences is a nonstop focus. It helps that I’m surrounded by a team of people who are always willing to assist. It’s also challenging trying to space out the characters that people really want to see. Rather than get them all out at once, we’ve had to consciously hold some back, so that there is always something to anticipate and look forward to. It’s not always the easiest thing to navigate—who to include, and more specifically, when to include them. Caleb: Campaign play has been very successful and well-received with the saga expansions. Lately I’ve been thinking quite a bit about how we might be able to do more with that idea. I hope you’ve enjoyed this State of the LCG article and found it informative. Moving forward, I’m hoping to make similar “State of…” articles a regular part of the Designer Journal series. Until next time… Happy Shuffling!